So today I have an untried, Smooth Sailing, from Essie's 2011 Braziliant Collection. I didn't pick this up too long ago - so it's still available. It's a pretty periwinkle blue with silver shimmer. The formula was really nice. This is two coats. There's a little bit of balding at the cuticle. But I honestly couldn't even see it until I looked at the pics. 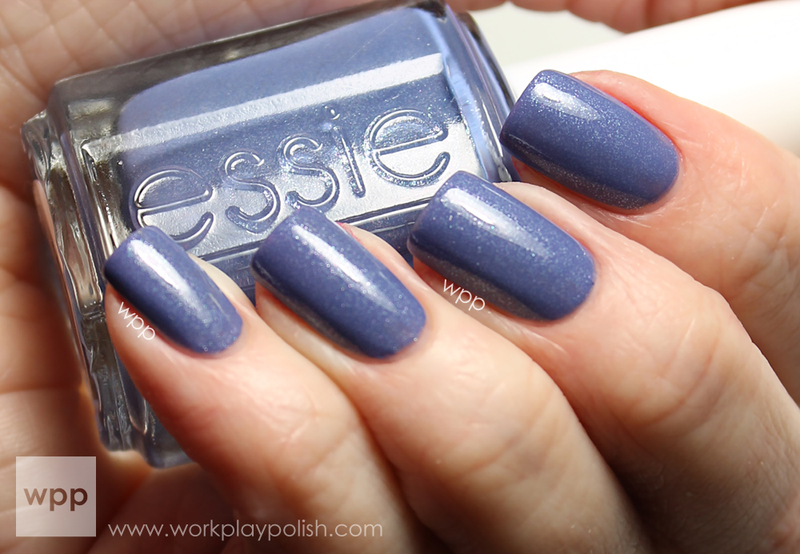 Curiously, if you look this up on the Essie site...the bottle shot is WAY more purple than real life. I know bloggers toil over getting accurate color (and sometimes it's just not possible). But you'd think the polish company would have it perfect. My daughter tells me she's tired of swatches and I need to do some nail art to "attract a younger audience." LOL. I don't know about that. I do intend to get off the swatch kick. Plus, Digit-al Dozen week starts 11 February and the topic is Love & Hearbreak. Any ideas?